Let kids get into the fun by making these cute little cracker treats themselves. 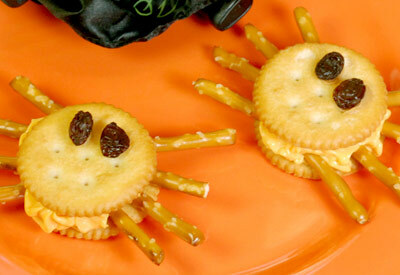 Put flavored cream cheese or a processed cheese spread between 2 round crackers to make a sandwich. Break pretzels in half and insert pretzel 'legs' into the filling. With a dab of peanut butter, set raisin eyes on top. CONSUMER: LIMIT ONE COUPON PER PURCHASE of products and quantities stated. LIMIT OF 4 IDENTICAL COUPONS PER HOUSEHOLD PER DAY. Coupons not authorized if purchasing products for resale. Only original coupons accepted. Copying, selling, reposting or auctioning of coupons is prohibited and constitutes fraud. Overage will not be provided in exchange for any coupons (i.e., NO CASH BACK). You pay sales tax. Valid in USA, APO�s FPO�s only. Void where taxed, restricted or prohibited. RETAILER: You are authorized to act as our agent to redeem this coupon in accordance with The Clorox Sales Company coupon redemption policy (available upon request). We will reimburse you for face value plus up to $0.12 handling if submitted in accordance with our Redemption Policy. Send coupons to: The Clorox Company 2122, NCH Marketing Services, P.O Box 880001, El Paso, TX 88588-0001.